If you read my blog long enough, you know I love desserts but nothing gets more excited than ice cream. (I do love me some beautiful entremets but that’s a very different and fussy dessert.) Anyway, if you follow my tweets and stumbled one of my updates over a month ago, I’ve mentioned I’m going to San Francisco in June. One of my planned stops will be at Bi-Rite Creamery since I’ve been hearing about their delicious but relatively minimalist ice cream flavors for years. 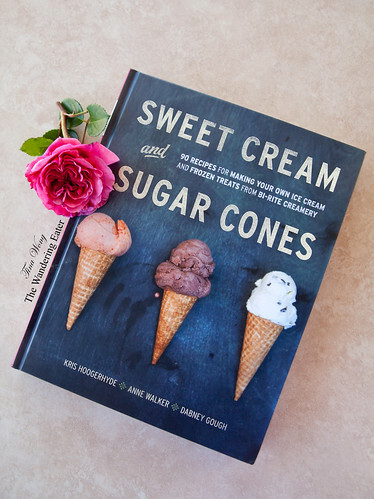 I’ve finally gotten my hands on their wonderful book, Sweet Cream and Sugar Cones: 90 Recipes for Making Your Own Ice Cream and Frozen Treats from Bi-Rite Creamery by Kris Koogerhyde, Anne Walker, and Dabney Gough, I have sensed their rustic, nostalgia meets modern ice cream flavors. There are sprinklings of baked goods recipes like brownies, cakes and various cookies to make ice cream sandwiches or ice cream cakes. If you are one of those dessert makers who have the motivation to make your own ice cream mix-ins (e.g. dark chocolate cookies for the Cookies and Cream Ice Cream) they have those recipes, too. 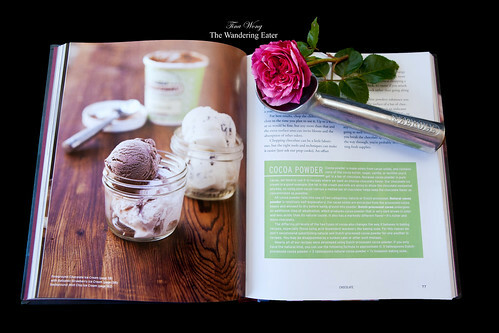 There’s also a lot of beautiful ice cream photos done by Paige Green that would make you crave for a pint of ice cream. Personally, I cannot wait to make the berry flavored ice creams, pistachio, Earl Grey, and green tea ice creams first since summer is creeping in soon. Or I will be the lazy person and wait until I get to San Francisco, buy and gorge on whatever flavors that grabs my attention when I’m at Bi-Rite Creamery. So, the awesome publishers of Sweet Cream and Sugar Cones are very kind to collaborate with me to giveaway 2 copies of this book! E-mail me at CONTEST [AT] THEWANDERINGEATER [DOT] COM with your full name and an e-mail address that you will check. Comment on this post (related to this content). If you do more than one of the above actions and would like to inform me by commenting, please keep it to 1 comment. Yes, if you do more, you’ll have a greater chance of winning a copy. Congratulations to the winners – Ariel and SenorSensible (aka Carl)! Emails are sent to you for further details. Thanks everyone again who participated! Delicious Salumi from Creminelli & Giveaway! I’ve been hearing about this book a lot recently – would love to try some recipes, just got a my ice cream maker attachment last summer so gotta break it out again soon! Sorry if my comment comes up as “NYCBakeSale” – it’s Lillian, aka @sweetsillianah:disqus . I’ve been hearing a lot about Bi-Rite and hope to visit myself one of these days as well… but in the meantime, I’d love to try some of their recipes! Gotta break out my ice cream maker attachment soon! I like Bi-Rite Creamery on Facebook. I tweeted about this GREAT giveaway. I been waiting for this cookbook to be released. I love there ice cream, baked good put also their mission and values. Ice cream and cake together is the best. Not just for Birthdays anymore! Now that I’m older! Emailed you! Wow, I won the book, how excellent! Thanks so much to Tina – The Wandering Eater, the authors, and all the nice folks at Bi-Rite Creamery and Ten Speed Press. I will be weighing the kids next door very soon and then again at the end of the Summer to see what impact this acquisition has made. I may weigh myself as well, that information will not be available for release. Now let’s eat some ice cream! Thank you Tina for letting Ten Speed Press host this post and choosing me! Thank you Ten Speed Press for hosting and making this book possible! Thank you Bi-Rite Creamery for the book and making all your great treats!Can’t wait to start making all the great treats in the book with my family. We all Scream for ICE CREAM!